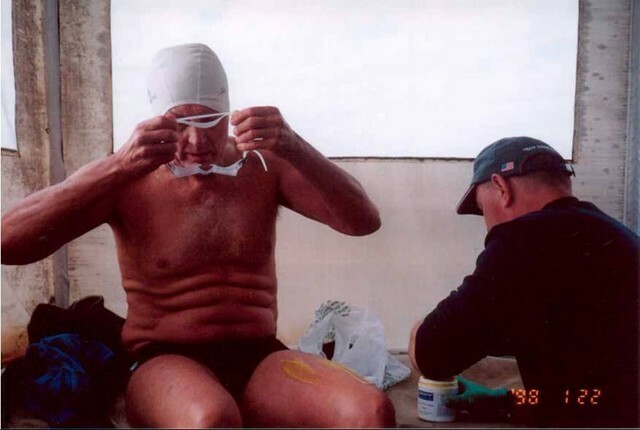 The last day of the final Neap tides in August 2004 ended with a horribly cold and wet day; however, the following day, Saturday 28th, dawned with a beautifully clear sky - and George started his record-breaking swim. 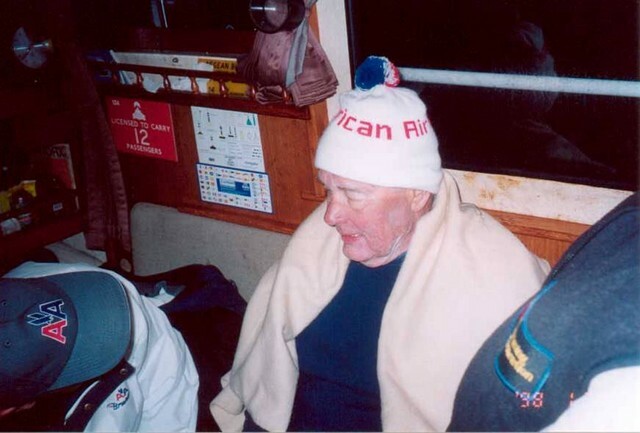 15 hours and 59 minutes later, at 1:12 am, and under a full moon, 6' 4" George had taken the title of oldest Channel Swimmer from Clifford Batt of Australia who set the previous record at 67 years and 241 days in 1987. For the last 300 metres, George was flanked in the water by Marcy MacDonald and Queen of the Channel, Alison Streeter. 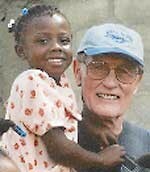 "When I arrived I just said 'Praise the Lord', stood on the beach, and raised my arms in a V sign". After his swim, he received commendations from The Connecticut State Governor and State Congressman. Senator Christopher Dodd read before the US Senate a commendation that referenced George's Channel record as the Oldest person. 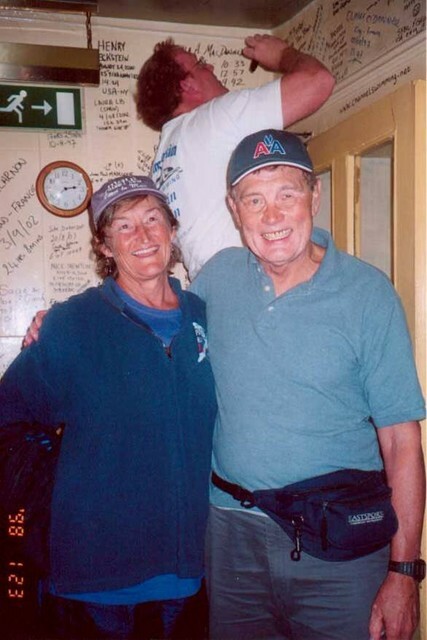 In the photos above, George is seen (Left) with his devoted, Canadian-born, wife Judy, and (Right) with Carol Sing, the oldest lady to complete the Channel swim. 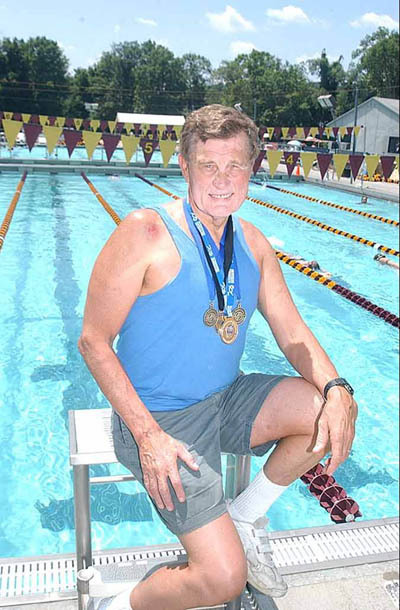 George started Masters swimming in 1973. 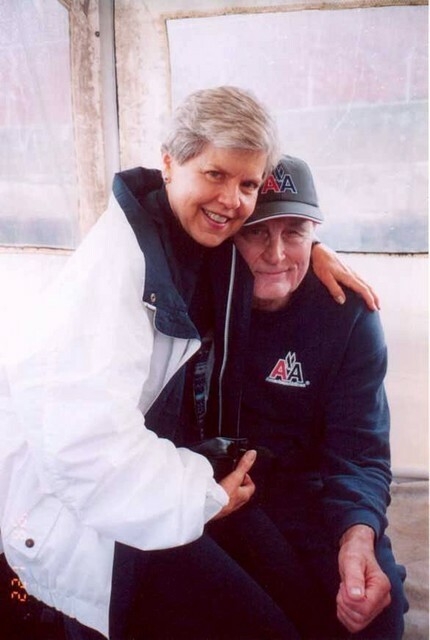 I had seen George swim in Masters competition in Canada back in 1985 and knew that he was fast - even with his schedule as a pilot with American Airlines (AA) at that time. Prior to his 30 years with American Airlines (3 years as copilot and 27 years as a Captain), George had a seven-year career with the US Air Force, flying B-52s. 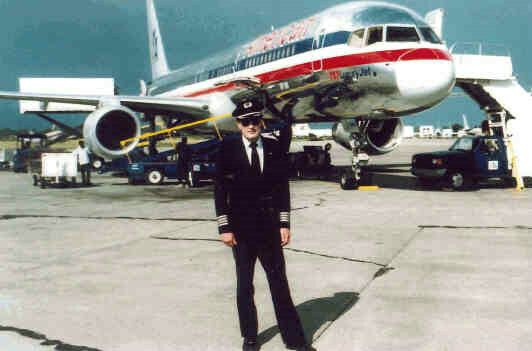 During his first three years with AA, George also flew as a pilot with the Air National Guard. 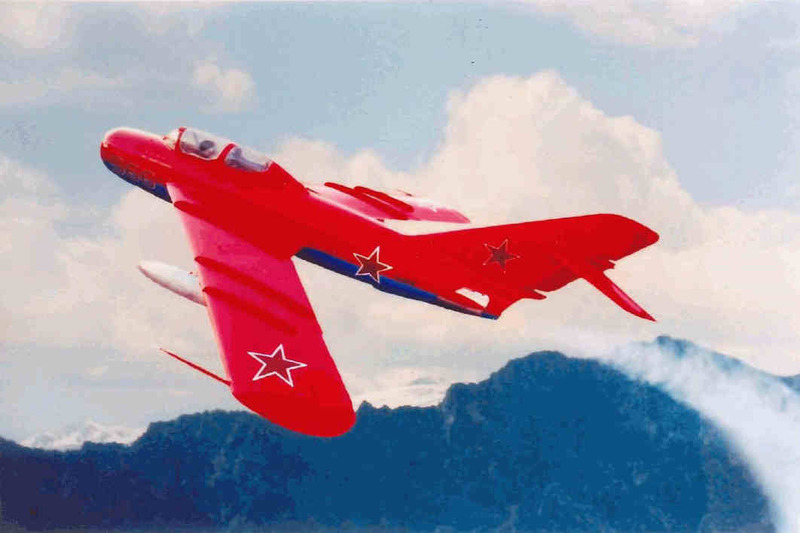 George retired from AA in 1994 and continued his flying interests with a Chinese-built Russian-designed MiG-17 fighter jet. 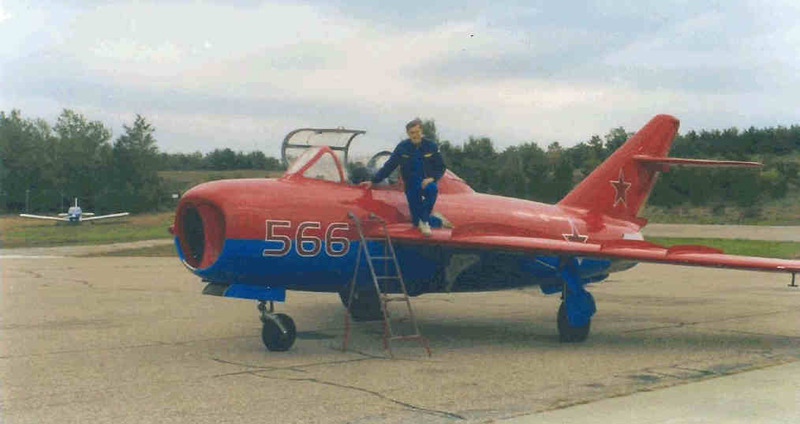 As of 2007, he had logged 28,000 hours as a pilot. While George did not claim to be fast, in the year prior to his Channel swim he was the US Masters Long Distance All-American and Long-Distance All-Star. He won the USA National 10 km and 2-mile open-water swims, as well as winning the FINA World Masters 3-km open-water championships in June 2004 in Riccione, Italy in a time of 46 minutes 58.3 seconds. And just in case you are sceptical about that 3-km open-water time, he placed third in FINA's 2004, World Top-10, LCM listings, with a 1,500 m time of 22:47.77, with David Radcliffe and Bumpy Jones less than 45 seconds ahead of him. 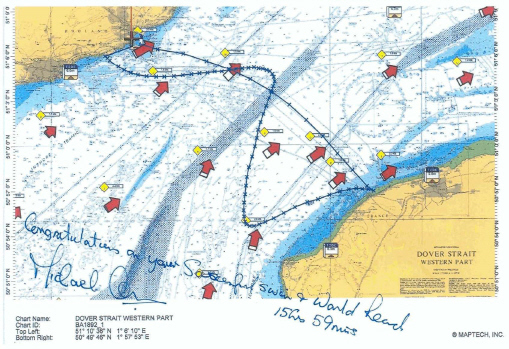 On my crossing 28 August 2004 I swam on the left side of the Aegean Blue for all 15 hours 59 minutes so that Michael Oram could keep better track of me from his port side pilot's position. But this did not stop me from spending equal time breathing to both sides, mostly bilateral but sometimes 2 or 3 breaths left and then two or three right. This might have been one of several reasons that at age 70 I never had any aches, pains, cramps or duress in any of my muscles, tendons or joints during the whole swim. I firmly believe in being able to breathe equally well to either side and devote equal time to both sides during training and when racing. I have always considered swimming as a lifetime commitment and am convinced of the merits of a balanced and symmetrical stroke on the overall harmony of stresses and strains on the spine, shoulders, joints, tendons and muscles. It is difficult to get symmetrical action from a stroke that always twists and pulls to only one side. There is invariably a difference in the way the two arms and shoulders work for one-side breathers and it must certainly not be good for the neck and spine over many years to twist the neck tens of thousands of times one way and never to the other. How can the muscles and tendons develop equally under this scenario? I teach hundreds of young kids to swim in the largest swim program in New England here at the Wilton CT YMCA. NONE of them leave my teaching class without being able to breathe equally well to either side. Just the opinion of an old 70 year old grandfather of 10. So, George has a wide range of interests. Reflecting his strong beliefs and through his family's non-profit organization "Center of Hope", his Channel swim raised funds to build an orphanage, medical centre and schools for children in the Haitian city of Hinche.